In 2015, motivated by a cousin, Gaurav* joined IIT Kanpur, making it to the institution through reservation. He had cracked the Joint Entrance Exam despite going to a Hindi medium school until Class X, but his success was shortlived. He was soon unable to compete with classmates in a relative grading system. By the second semester, his interest in academics had declined. After the third semester, his academic programme was terminated. Gaurav wasn’t the only student who was expelled that semester. 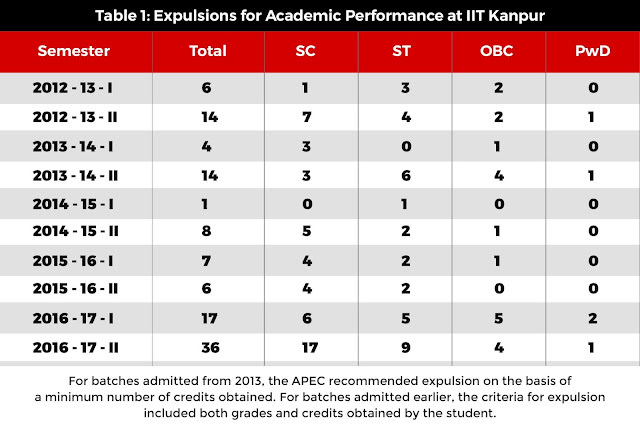 According to data obtained by YKA in an RTI reply from IIT Kanpur, the institute expelled 17 undergraduate (UG) students that year on grounds of academic performance – every one of them hailing from SC (6), ST (5), OBC (5), or PwD category (2). That’s not all. Data obtained through RTI also reveals that this has been the case at IIT Kanpur for at least the last 5 academic years, with every undergraduate student being expelled by the institute belonging to SC/ST /OBC/PwD category (See Table 1), suggesting a systemic failure in addressing caste discrimination and accessibility on campus. The only exception was the second semester of 2016-17, where too, over 80 percent of the expelled students belong to these categories. These students were expelled on the recommendation of the Academic Performance Evaluation Committee (APEC). The committee made recommendations for expulsion on the basis of credits and grades obtained by the students. Activists say the reason this system favours general category students is because the institute fails in addressing discrimination. Odile Henry, a professor of sociology at the Paris8 University who was researching caste discrimination at IIT Kanpur from December 2014 to December 2016, told YKA that students from the SC, ST, and OBC communities feel “very isolated” on campus. Manish Gautam, an alumnus of the institute, describes this isolation as stemming from what activists call “intergenerational discrimination and poverty”. “I could not live freely, because I studied in Hindi medium, sarkaari school jahaan kuch padhaya nahi jaata hai (government school where nothing is taught), whereas some of my classmates were coming from better schools ,” he explains. “Caste discrimination is there, but it is very implicit,” another research scholar at the institute told YKA on the condition of anonymity. It comes to the fore when a professor asks a student’s last name, he said. Since seats were increased to provide reservation to OBC students, the research scholar said professors also talk casually about the declining “quality of IITs” due to “higher student intake”. For students with disability, this exclusion begins with inaccessibility to the campus. Agrawal claims the institute acted on an accessibility audit done two years ago, but could not explain how hearing-impaired or visually-impaired students access classrooms. “I visited their (IIT Kanpur’s) library a couple of years ago. While it’s an interesting area, but how do they ensure that people with different abilities move through it? Likewise their lecture halls, their hostels,” says Gaurav Raheja, an associate professor at IIT Roorkee who was also empanelled as an access auditor for the Accessible India campaign. He requested his comments be not understood as a formal response of the institute. Gautam says that apart from subtle discrimination and exclusion, IITs avoid discussions on caste, citing the ban on Ambedkar Periyar Study Circle at IIT Madras. Henry observed this at IIT Kanpur when her research was discontinued by the institute, she alleges, for the “unofficial reason” that she participated in a discussion on the suicide of Rohith Vemula there. The effect caste discrimination has on students is compounded at IIT Kanpur by the fact that they don’t have professors from their community either. The annual reports of the institute from the year 2012-13 to 2015-16 reveal that while the total number of teaching staff increased from 348 to 394, the number of SC teaching staff alternated between 2 and 3, and the number of ST and OBC teaching staff remained constant at 0 (See Table 2). Admitting the numbers were abysmally low, Agrawal claimed this is so because many professors “have competed in the open and they refuse to put a label against their names”. “So the number that you see is actually those that have declared in their forms that they are from this category,” he said. Beena Pallical, a national coordinator at National Campaign on Dalit Human Rights, says this is like claiming to be an equal opportunity employer by just showing an empty chair. “Why don’t they consciously go and look for those people who can fill those seats? It’s part of their mandate that they have to have these quotas fulfilled,” she said. The institute, for example, seems to have had no problem filling up the quotas for the non-academic staff of the institute. The percentage of SC, ST, and OBC non-academic staff at the institute, for example, are closer to the reservation requirements, the same annual reports show (see Table 3). Clearly, while reservation policies mandated by the government ensure diversity in the admission process, campus doesn’t do enough to preserve it. So even though Agrawal confirmed the presence of an SC/ST/OBC/PwD cell, the truth is that if a student wanted to contact the cell, they wouldn’t know where to look. The cell does not find any mention on the institute’s website, unlike the Women’s Cell or the Institute Counselling Centre. The only record of such a cell existing is in the annual reports of IIT Kanpur, where too it is only an SC/ST/OBC cell before 2015-16. The institute at times seems to have shied away when students have asked for systemic help. For example, when an elected student body asked the Senate Undergraduate Committee (SUGC), which formulates academic policies of the institute, to create a remedial programme for “academically deficient students”, the SUGC formed another committee in October 2015 to look into the matter. While this committee acknowledged the need for such a programme, it shot down key demands like running summer courses for students stating the demand was not acceptable to departments, the minutes of a July 2016 SUGC meeting show. “Lack of interest of academically deficient students and the stigma attached to it” and “shortage of faculty” for running new additional courses were the other two difficulties cited. Not everybody is satisfied with the existing mentorship programmes either. “They are like surveillance to just ensure that students don’t commit suicide – that kind of attitude is there,” Gautam, who was also on academic probation at the institute, told YKA. He says he has only now been able to understand that what he actually needed was respite from the baggage that he “came through quota”. Three former students who had been on academic probation at IIT Kanpur in the past five years told YKA that the schooling that precedes IIT makes the institute a challenge for students from SC, ST, OBC communities or for those who are disabled. The problem is that IIT Kanpur continues to perpetuate that challenge, activists say. “I want IITs to lead as role-models rather than with an approach that we have done this much and it is a great thing and let’s have an applause,” Raheja says. He explains that IITs need to make more efforts at periodic intervals to make the campus more inclusive and not sit idle because a quota exists. Unless IIT Kanpur does that, it is likely to remain a closed brick-and-mortar entity for nearly half of its students – who avail admission through reservation. *Name changed on the request of the student.